From ‘baby farming’ to licensed childcare centres, the care of young children has evolved as ideas about child welfare, education and women’s employment have changed. In 2010, 188,924 pre-school children attended licensed childcare centres in New Zealand. Family, friends and neighbours of parents have always helped care for young children. In the 19th century people who were paid to care for a number of babies became known as ‘baby farmers’. The first crèches to care for children of women who worked were set up in New Zealand during the late 19th and early 20th centuries. Kindergartens – childcare centres where children learned as they played – were also established. After the Second World War the government provided funds for kindergartens. Playcentre was started by a group of mothers in 1941. Parents attended courses on early childhood education, and were rostered as playcentre supervisors. The number of children at childcare centres began to grow. In 1970, 40% of three- and four-year-old children attended some form of childcare centre. The first kōhanga reo (language nest) opened in 1982. Children and staff spoke Māori. Childcare centres were also set up where Pacific languages were spoken. The first Kindercare childcare centre, a privately operated facility, opened in 1978. In the 1980s childcare and pre-school education were combined at pre-school centres. In 2010, 58% of children in care were in licensed centres, 20% were in kindergartens and 8% were at playcentres. The government subsidised childcare. 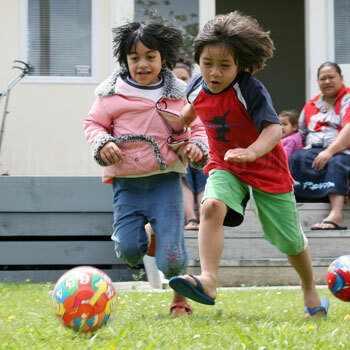 From 1996 centres delivered the early childhood education curriculum, called Te Whāriki.